We are happy to announce Insights for your builds. 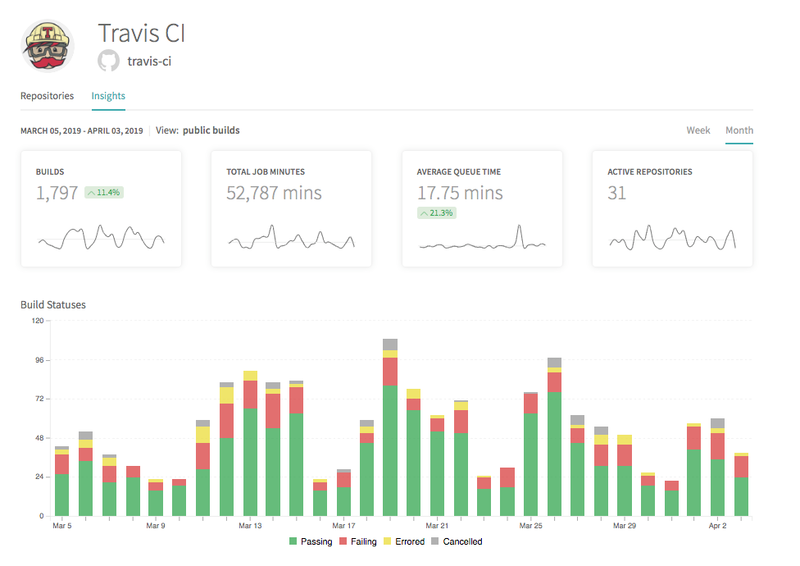 Insights will bring you more intuitive display of how you and your team use Travis CI. What’s the total number of builds that your organization has run over the last month? You can now answer all of these questions by heading to the Insights tab! As an example, take a look at the Insights for the travis-ci organization: Travis CI: Insights tab. Whenever you push to GitHub, or open a pull request, a Travis CI build is triggered. This build can have one or several jobs, and the final status is what we report back to GitHub and that’s what you’re seeing on the Build Statuses graph. In case you’re curious, all of these build jobs are taken into account within Insights in the “total job minutes chart”, which measures the total number of minutes you’ve been building, as well as a percentage comparison with the last period. The top charts on the Insights tab provide a pulse of how often you and your team build, as well as the average time your jobs wait in the queue to start. While these graphs give you an overview, they’re very reliable and you can hover over to get the daily corresponding data: number of active repositories, average queue time and so on! Who can see private build Insights? You can fully customize who can see your private build Insights. By default, they are only shared with organization owners, since they’re the ones with access to the whole account data. Account owners can expand this to cover all organization members or open them up for everyone to see. We’d love to hear what you think of Owner Insights and if there’s something that you’d like to see included or improved! Let us know in the Travis CI Community Forum: Insights thread.